Cejudo vs Dillashaw: UFC on ESPN - What Did We Learn? Cejudo vs Dillashaw: UFC on espn – What did we learn? UFC on Espn – What’s changed? As we pass from one era to the next – specifically the Fox era to the ESPN era – what did we learn about the UFC and its future? Well, for one we learned that Dana White is fully prepared to die on the Greg Hardy hill. “One thing I did learn about Hardy tonight, he can fight”, okay Dana, okay. I believe we’ll have to learn to live with Stephen A. Smith, a man with seemingly nothing to say about the sport of MMA. We learned that crowds love cowboys and violence, but still aren’t too hot on wrestling. That starting times are now likely to suffer due to various other sports presentation on ESPN, hooray for getting to bed at 7 A.M. in the UK. We learnt some things have changed, and some haven’t. Let’s see. Fight Night Brooklyn saw the debut of much touted Brazilian striker Ariane Lipski. The highly endorsed 24-year-old had earned her nickname. “Queen of Violence”, with a spectacular run in Polish promotion KSW. Many saw her as a potential new Brazilian star and contender in the flyweight division – the Shevchenko division. She had a destructive aura, so when she was “given” the lovable and scrappy but inconsistent Joanne Calderwood, many assumed a successful start to her UFC stay. JoJo had other ideas.Utilising a surprising ground game to control and drain Lipski in the first round, then outpointing her in the second and third rounds pretty much everywhere, Calderwood picked up the clear decision. Lipski was by no means embarrassed, but it highlighted the difference between the UFC, the big show, and the rest of the world of MMA. Whether this was a case of first time octagon jitters or Lipski simply hadn’t been exposed to this level of competition in KSW – which true – we won’t know for a while, at least not until the “Queen of Violence” gets back in there. Either way it was an excellent win for Calderwood, who called out Jessica Eye after the fight. At least I think that’s what she said; I had to turn my TV all the way up to hear her. This further proves that the UFC really is a different beast. The UFC couldn’t have picked a better fight for the featured bout on the televised part of the ESPN card. 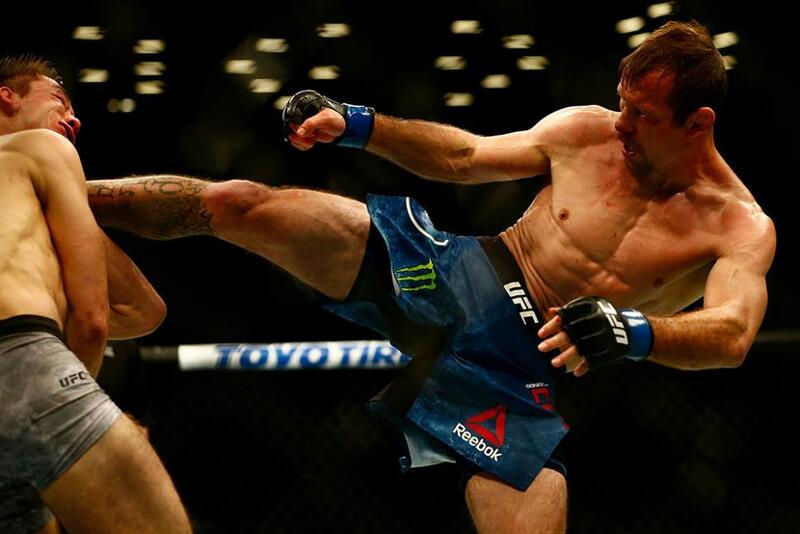 The living legend and greatest fighter to never win a world title (yet) Donald “Cowboy” Cerrone delivered one of his late career best performances against a young, hungry athletic opponent in Alexander Hernandez. This could have gone one of two ways – obviously – but in this case the fight took on much more importance than a simple rankings clash. Cowboy has now firmly set his sights on the belt upon his return to the lightweight division. After delivering a beat down Cowboy called out none other than Conor McGregor. McGregor took to twitter and in a rare case of clarity simply said “For a fight like that Donald, I’ll fight you. Congratulations.” After a career of fighting anyone anywhere, Cerrone has declared that now is the time to pick his fights and go after the belt. He credits this refocus with the birth of his son Danger – because what else did you think Cowboy would call his son? Cowboy’s last two fights have taken place with his infant son at ring side and it showed in his performances. He looked sharp and motivated, and I believe him when he says he’s coming for the belt. At 35 years of age this is likely his last chance to climb to the top, and what’s a better fight to do that with than McGregor? Conor needs a good win upon his return, and Cowboy is a name and they have a history of heat. It’s a perfect fight in this writer’s opinion. Add “Dad Cowboy” to the final form pantheon of “TRT Vitor”, “Sea Level Cain” and “Motivated Penn”. Now we come to the ugly portion of the night. Greg Hardy vs Allen Crowder filled up the co-main event slot. The placement of both Greg Hardy and Rachael Ostovich on this card has been discussed ad nauseam, and I have nothing to add. On its own however, this was a shambles. Emptying his gas tank in the first two minutes of the first round. Hardy heaved as Crowder took him down and held him there. Crowder, not exactly Ben Askren himself, did allow Hardy to get up eventually, and by that point neither man really had much to offer on the feet. Second verse, much the same as the first. Crowder tried to implement his grappling game, but both men were so exhausted nothing really happened. Eventually, after a failed takedown attempt, Crowder found himself on his knees under a standing Greg Hardy. I remember thinking “is he going to do it?” And then in what seemed to be slow motion, Hardy drove his knee into the temple of Crowder, sending him cratering to the canvass. He attempted to follow up with ground and pound – because of course he did – but Dan Miragliotta was in no mood. He called off the fight and the Brooklyn crowd’s indignation boiled to the surface. You couldn’t have chosen a worse way for Hardy to debut. Dana White somehow found good things to say about Hardy, “he can fight”. Apparently White sees something in the star power of Hardy, despite the fact that he has a sordid past, was disqualified in his debut fight and had the entire crowd booing him. I don’t know where Dana finds this confidence, but he has it, and we are going to have to learn to live with it, if we weren’t already. And now we move to the main event, an actual high level fight with a legitimately exciting and shocking conclusion. In the minds of many we received the least probable outcome: Henry Cejudo knocked TJ Dillashaw out in 32 seconds. Well, technically he did, not that TJ is too quick to accept it. He immediately complained about the stoppage and has continued to do so in multiple interviews. It’s a tricky one to assess. TJ was still moving but he had been dropped twice times and Cejudo was all over him. Dana White called the stoppage “horrible” but I think it’s pretty clear he wanted Dillashaw to win so I don’t know what that’s worth. Whether he denies it or otherwise, Dana seems to be leaning towards cutting the flyweights. A win for Dillashaw would have made that a lot easier, but he was denied of that. Cejudo went into the fight saying he was doing it not just for himself but for the whole division. He may have saved his title, but it remains to be seen whether not he saves the weight class. To make matters a little more complicate “the Messenger”. Fully intends to move up to bantamweight and rematch Dillashaw for his belt. Things were already messy down there in lower divisions, this will likely only make things worse if he wins. He also may have bagged a date with Nikki Bella thanks to number 1 P4P MMA matchmaker Ariel Helwani. So, in the wake of the UFC’s ESPN+ debut? Well, we learned that Dana White will do anything if he thinks he can make money doing it. We learned JoJo Calderwood is no gimme fight. That Donald “Cowboy” Cerrone is not a man to be messed with and that having a child really can change you. We also may have learned what Conor McGregor’s next move is. Maybe we learnt that shrinking your body down to 125 pounds and coming out looking like a zombie. Is not necessarily optimal conditions for a fight, or perhaps Henry Cejudo is just that good? I think above all else we learnt that the more things change, well the more they’re going to stay the same. Same fights, same crazy MMA happenings and wackiness. Here’s to the ESPN era, hopefully shows do in fact start a little earlier. So I can get to bed at reasonable time here in the UK. “Record it and watch it the next day” you may say; well I can’t, I’m in too deep. Long may MMA reign.